My favorite North Carolinians are back for more murder and mayhem and, this time, they’ve brought an army. A group of Civil War reenactors have taken over a patch of land on the grounds of Marshfield Manor. But before any historic battles get underway, a bigger problem surfaces: one of the reenactors has been stabbed, right in the middle of camp. Not only was the victim a man with scores of enemies, but he is the brother of another Emberstowne murder victim. And, before his own death, has accused none other than Jack Embers of being his brother’s killer. Is Jack really a murderer? In order to solve the mystery and secure Jack’s freedom, restore his reputation, and reheat their fledgling romance, Grace enlists the help of her nosy assistant Frances, sending her back to the Civil War era in a series of undercover missions at the encampment. But you know what they say about wanting a job done right: you just have to do it yourself. 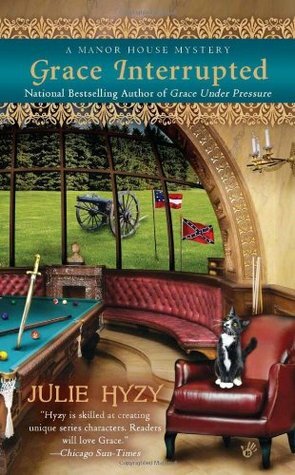 Grace Interrupted further defines Grace’s work and personal life, most notably with the addition of my favorite character yet: Bootsie. The adorable tuxedo kitten steals all of her scenes purrfectly (I couldn’t resist!). I do wish, however, that we would learn more about and gotten to know Grace’s roommates, Bruce and Scott, better. They seem to kind of dance around the edges of the story and the narrative and I hope that author Julie Hyzy invites them in closer in future Manor House Mysteries. Love this series, and am continually drawn to it by these terrific covers. The artist always takes me “right into the manor” in a way that meshes beautifully with what I imagine as I read the description within the passage.